Krish, my little brother 😉 recently wrote about HD and I loved that article and agree with him wholeheartedly. Over the last few days, I have watched a few movies… One of them was fantastic (saw it before), couple were ok, and one was just awful. The movie that I loved the most was Kung Fu Hustle. I had seen it before but it was definitely enjoyable watching it again. Funnily enough, I didn’t watch it in HD (Although I recently got a HD TV) since it was on Film4 (which, unfortunately, does not have a Film4 HD). I have been thinking about what I love the most about the movie… Is it the story? The story is great and I do love it but it is a simple story although it does bring in humour, romance, action and edge of the seats suspense fantastically well. Would I watch it if it was a low budget movie with the same story? Absolutely! It also has absolutely fantastic special effects. Absolutely beautiful. If the story was not as good but the special effects was just as fantastic, would I still watch it? YES! I am certain the movie looks better in HD but would I watch it without HD. Since I didn’t see it in HD, yes, of course I would. Will I watch it in HD? Hell Yeah! I also watched “Man Of The Year” with Robin Williams. Fantastic movie… Again in HD. Again, didn’t notice the HD part but I checked it side by side and the quality was better. I suppose it all comes down to what we take for granted and what we are used to. With the big plasma tv’s the image gets stretched a little too much and this is noticeable. HD solves this. Of course 5.1 sound is beter than Stereo. I sincerely believe that everything has its place and a movie can be good just because it has a fantastic story, fantastic special effects or fantastic sound. It also needs to be delivered just right. Most importantly, for a movie to be fantastic, you need it ALL!!! Thats what makes it a movie to be watched repeatedly. There are of course movies that buck this trend. 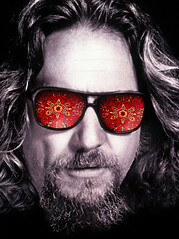 The Big Lebowski is an absolutely fantastic movie.